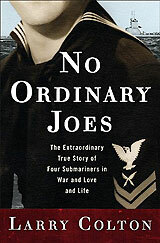 Book review: "No Ordinary Joes"
This review first appeared in Turbula in October, 2010. Written with the best of intentions, Larry Colton's history of four American submariners who spent the bulk of the Second World War as prisoners of war in Japan is ultimately undercut by a consistent lack of focus. Unable to decide whether he was writing a straight-ahead war story or an epic tale with historic and political overtones, Colton ends up bouncing from one style to another. The end result is a book that at times does a solid job of documenting the horrors of life in a Japanese POW camp, but too often wanders into amateur psychoanalysis more common to modern histories than most literature on WWII. What saves Colton is his strong skill at writing narrative. Having spent hours interviewing the four veterans (Bob Palmer, Tim McCoy, Chuck Vervalin and Gordy Cox), Colton was able to craft detailed scenes of the men's final mission on which their boat was damanged and then scuttled, a Japanese patrol boat picking them up. And Colton also does a nice job of setting up the men's presence on the crew of the USS Grenadier, laying out the stories of their boyhoods and Navy service before that fateful mission. The chapters on the men's time as POWs is also quite good. In fact, the first two-thirds of the book is a very nice, solid WWII history told through the eyes of four average Americans who went and fought it  albeit with more fixation on the men's sexual escapades on shore leave than most histories on that war. But the premise of the book is that the men's POW experiences ended up shaping their failed relationships with their wives and children after the war. And in those chapters, Colton's own conjecture intrudes so sharply that the storytelling can't help but suffer. While it's fair to point out that most WWII histories end with the war, preserving a sort of black-and-white certaintude that the men and women who fought that war surely didn't possess during the social upheaval of the 1960s, imposing post-Vietnam values on the World War II generation is no more faithful to history than "the Greatest Generation" mythology. The post-war chapters dabble in the victimhood world view, in which everybody is a victim of something: racism, injustice, poverty, what have you. But that worldview is a recent development, coming into prominence only since the late 1980s (and then only among a portion of the population). While millions of people today have their life experiences partially shaped by their acceptance of that outlook, it's hard to see in these men's own words that they buy into it. They were, as are we all, products of their time. In trying to examine these men's lives through the prism of subsequent generations' values, Colton not only undermines the last third of the book with his judgmental tone (although he obviously admires and has real affection for these men), but does his subjects a bit of a disservice. In an epilogue, Colton points out that some of the men died before the book was complete. One wonders how much the survivors recognized themselves in the final product. Still, the weaknesses here can't take away from the powerful story telling in the first part of the book. Simply in preserving the stories of four veterans who served their nation in time of crisis, Colton has done important work. At a time that we're losing veterans of World War II to old age at an accelerating rate, documenting their histories is itself an honorable service to the generations to come and their ability to understand one of the most defining conflicts in world history.